innings in Sugar Land's loss to Lancaster. SUGAR LAND, TEXAS (July 26, 2015) The Sugar Land Skeeters got on the scoreboard first, but could not hold on to the lead, dropping their fourth game in a row to the Lancaster Barnstormers by the score of 2-1 on Sunday, July 26, 2015 at Constellation Field in the Houston suburb of Sugar Land, Texas. With the loss, the Barnstormers now lead the Skeeters 37-36 in all-time games and hold a 7-6 advantage in 2015. 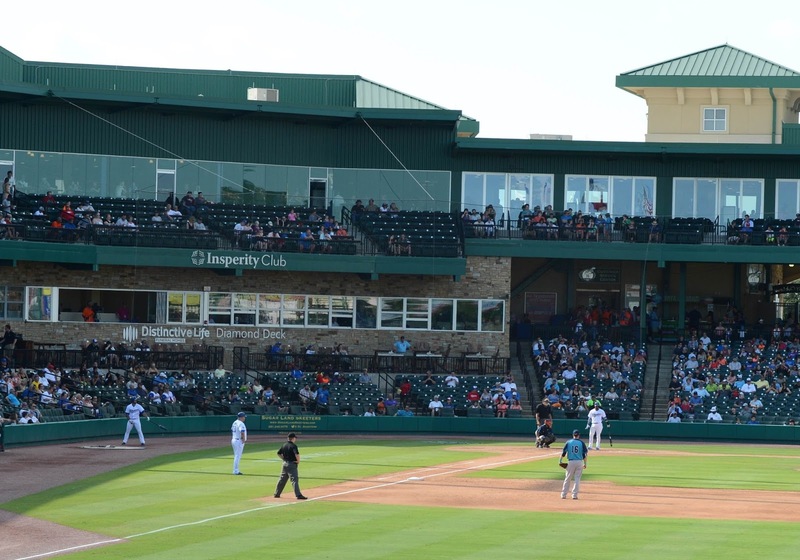 The game was scoreless through the first four and a half innings, when the Skeeters finally got on the scoreboard when shortstop PatrickPalmeiro slammed a double into the center field wall for a double. 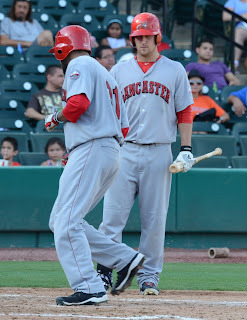 AllanDykstra, who was on first base as a result of being hit with a Bryan Morgado pitch, scored his sixth run of the season. two-run homer in Lancaster's 2-1 win over Sugar Land. Lancaster wasted no time in coming back; scoring two runs in the sixth inning on a Brian Cavazos-Galvez home run, with Yusuke Kajimoto scoring from first base. It was the Albuquerque, New Mexico native’s twelfth round tripper of the season. Sugar Land’s first baseman Delwyn Young snapped a 15-game hitting streak, going 0-for-4 in the loss and dropping his batting average to .258. He currently has 76 hits, 12 doubles, and seven home runs, and 24 RBI in 2015. Skeeter starter Tim Stauffer completed seven full innings; giving up five hits and two runs, both of them earned, in receiving the loss. Lancaster starter Morgado secured the win, his second of 2015. Pete Andrelczyk, pitching one inning in relief, received his fourth save of the season. The Skeeters managed only three hits in the loss and have dropped their last four games, heading into a seven-game road trip. They will face the Camden Riversharks in a three-game series. July 29-30 before heading to Regency Furniture Stadium to play Southern Maryland on July 31 to August 3. They will return to Constellation Field on Wednesday, August 5 for a four-game series against the Long Island Ducks. Sugar Land Skeeters at Constellation Field. 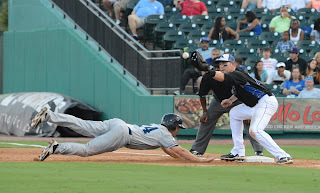 SUGAR LAND, TEXAS (July 24, 2015) The Sugar Land Skeeters could not get the hits to turn into runs and as a result, dropped a 3-0 decision to the Lancaster Barnstormers at Constellation Field in the Houston suburb of Sugar Land, Texas on Friday, July 24, 2015. The loss was their second straight to Lancaster and dropped the Skeeters’ record to 7-8 for the second half of the Atlantic League season. They are currently 36-35 overall for the season and will face the Barnstormers two more times on the current home stand. Lancaster struck first with a solo home run by shortstop Lance Zawadzki in the second inning. He connected on a 3-1 pitch for his second round tripper of the season. They added two additional run in the fourth inning. First baseman Brian Cavazos-Galvez send left fielder Kent Matthes home from third base. Later in the inning, designated hitter Mike McDade scored on an error by Skeeter shortstop Amadeo Zazueta. Sugar Land connected for six hits, but could not get anyone home and with the loss, gave Lancaster starting pitcher Shunsuke Watanabe his fifth win of the season. Roy Merritt received the loss for the Skeeters, dropping his record to 3-3. Barnstormer relief pitcher was credited with the save, his third in 2015. Sugar Land second baseman Renny Osuna went 2-of-4 at the plate while left fielder Kevin Russo was 2-for-5. Both teams committed two errors in the match. 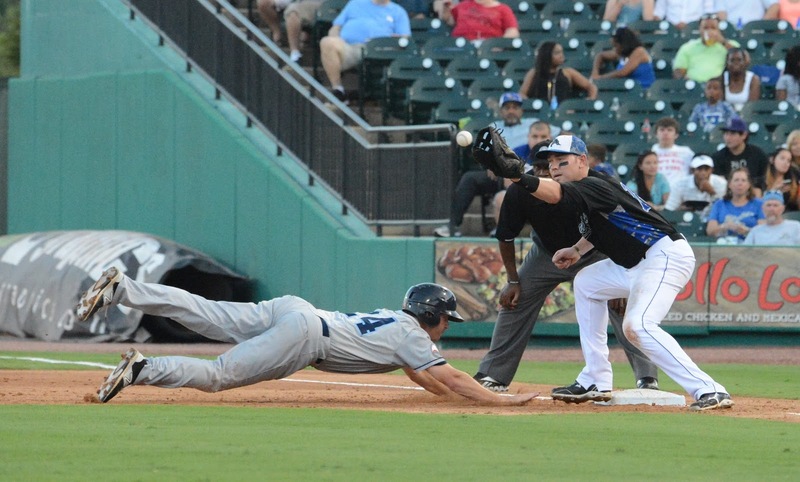 The Skeeters left 11 runners on base, while Lancaster stranded four. Their Saturday, July 25 matchup is scheduled for a 6:05 p.m. CDT start with right-hander Matt Wright (5-3 3.97 ERA) scheduled to take the mount for Sugar Land. The Barnstormers have listed right-hander Ray Hanson (1-0, 1.80 ERA) as their starter. CORAL SPRINGS, FLORIDA (July 23, 2015) The HBU women's golf team finished tied for eighth in the country for the 2014-15 season with a 3.731 combined GPA, the Women's Golf Coaches Association (WGCA) announced on Thursday afternoon. The Huskies shared the classroom mark with East Tennessee State, while New Mexico posted the top GPA of 3.799 and was the recipient of the WGCA All-Scholar Team Award. "We are extremely excited about ladies' top-eight finish for the WGCA All-Scholar GPA Award, separated from the top by just 0.068 of a point," head coach David Shuster said. "It's something that they have been working for over the last few years, after just missing out the last couple seasons. It takes a lot of commitment of their personal time, from them all, to accomplish this, especially considering how many hours they also put into their golf practice. We are very proud of them all." 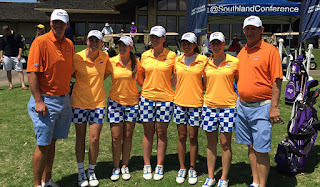 Four HBU golfers; seniors Rachel Mulkey and Caitlyn Cassity, junior Brook Johnston and sophomore Charlotte Hartshorn; were named WGCA All-American Scholars on July 6. The Women's Golf Coaches Association, founded in 1983, is a non-profit organization representing women's collegiate golf coaches. The WGCA was formed to encourage the playing of college golf for women in correlation with a general objective of education and in accordance with the highest tradition of intercollegiate competition. Today, the WGCA represents over 500 coaches throughout the U.S. and is dedicated to educating, promoting and recognizing both its members and the student-athletes they represent. SUGAR LAND, TEXAS (July 22, 2015) Powered by a pair of three-run home runs, the SugarLand Skeeters slugged their way to a 7-1 win over the Lancaster Barnstormers at Constellation Field in the Houston suburb of Sugar Land on Wednesday, July 22, 2015. With the victory, the Skeeters raise their season record to 42-40 and their second half record to 6-6 in the Atlantic League. The 3,325 baseball fans in attendance saw starting pitcher Joss Geer throw seven complete innings, giving up nine hits and the single run. He raised his season record to 4-2. The right-hander struck out five batters, walked two and raised his ERA to 3.21 for the season. At the plate, catcher Chris Wallace collected his twelfth home run of the season with his three RBI blast. That moves him into the lead in the home run race in the Atlantic League. Left fielder Johan Limonta received his first home run while playing for the Skeeters in his three-run shot. 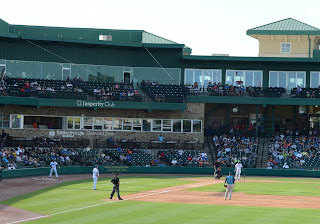 The Skeeters will continue their current series against Lancaster with a double-header on Thursday, June 23, 2015. The first game has an 11 a.m. CDT first pitch with the second game scheduled for 7:05 p.m. The series will continue on Friday, July 24 with a 7:05 p.m. CDT first pitch. 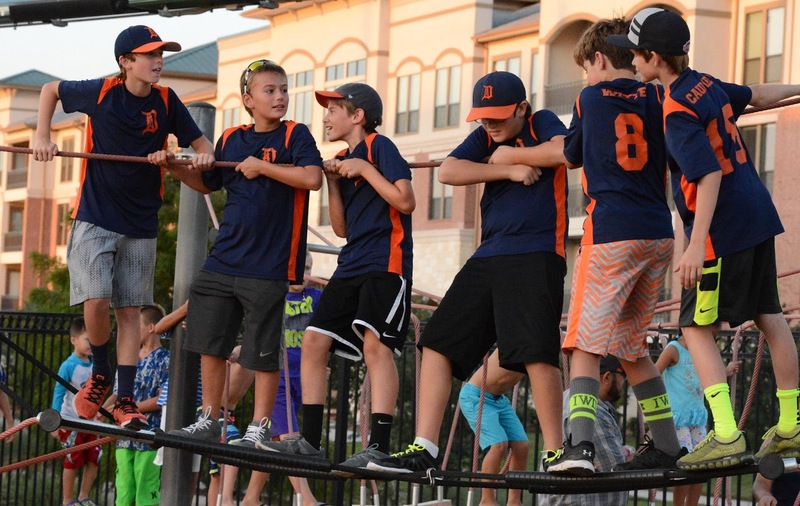 The Saturday, July 25 game will begin at 6:05 p.m. CDT with the Sunday, July 26 match up begining at 5:05 p.m. CDT. NORMAN, OKLAHOMA (July 22, 2015) Houston Baptist University junior golfer Isaiah Huerta was named a Cleveland Golf/Srixon All-America Scholar by the Golf Coaches Association of America, the organization announced on Wednesday afternoon. Huerta, a native of Duncanville, Texas, was one of two Huskies to compete in all 11 tournaments on the year finishing third on the team with a 74.77 stroke average across 30 rounds. Huetra placed inside the top 20 two times. He recorded six par and two under-par rounds. Huerta is one of eight golfers named from members the Southland Conference and one of 11 named from schools in state of Texas. To be eligible for Cleveland Golf/Srixon All-America Scholar status an individual must be a junior or senior academically, compete in at least three full years at the collegiate level, participate in 50-percent of his team’s competitive rounds, have a stroke-average under 76.0 in Division I, 78.0 in Division II, 77.0 in NAIA and 79.0 in Division III, and maintain a minimum cumulative grade-point average of 3.2. A recipient must also be of high moral character and be in good standing at his college or university. In all, 206 players in Division I, 91 in Division II and 17 in NAIA earned the honor. Additionally, 34 honorees were added to the previously released Division III Cleveland Golf/Srixon All-America Scholars. HOUSTON, TEXAS (July 10, 2015) After giving up three runs in the first inning, the SugarLand Skeeters tried to keep the Southern Maryland in check, but could not contain the bats of the Blue Crabs; falling by the score of 6-0 at Constellation Field in the Houston suburb of Sugar Land on Friday, July 10, 2015. With the loss, the Skeeters fall to 4-10 against Southern Maryland in 2015. The Blue Crabs added two runs in the fifth inning along with an insurance run in the seventh to secure the win. The Skeeters are on track to score 512 runs this season, which would be the lower in team history. The Skeeters have been known as a second-half team in their first three years of existence; posting 136-94 combined record in the months of July, August, and September. Sugar Land connected for two hits, but could not get the bats to advance any runner home. On the contrary, the Blue Crabs scored their six runs off 10 hits, while taking advantage of two Skeeters errors. This current series against Southern Maryland will continue on Saturday, July 11 with a 6:05 p.m. first pitch and conclude on Sunday, July 12 at 5:05 p.m. Right-hander Sean Gallagher is schedules to take the mount on Saturday while left-hander Roy Merritt slated for Sunday. 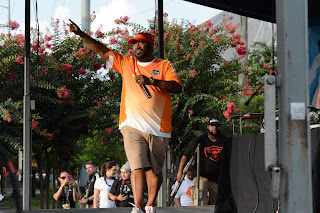 HOUSTON, TEXAS (July 3, 2015) Houston rapper Bun B preformed at the Bud Light Beer Garden prior to the Houston Dynamo playing the Chicago Fire at BBVA Compass Stadium in Houston on Friday, July 3, 2015. DJ Charlee got the performance started before Bun B took the stage and got the soccer fans hopping to his fast beat rap and musical stylings. Bun B, whose given name is Bernard Freeman in one half of the southern rap duo UGK, also known as UnderGround Kingz. 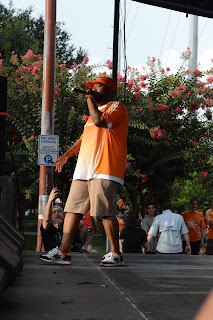 He performed hits from his various albums to soccer and rap fans alike who were in attendance for the Dynamo-Fire Major League Soccer game. The 42-year old Port Arthur, Texas native has released four albums since 2005; Trill, II Trill, Trill OG and Trill OG: The Epilogue; and has over one million followers on Twitter. He has appeared in three films since 2010; Ghetto Stories (2010), Video Girl (2011), and Something from Nothing: The Art of Rap (2012). BBVA Compass Stadium is becoming a hot-bed for musical performances in the Houston area; previously hosting county-music performers Kenny Chesney, Jake Owen, and Chase Rice on May 22. They are scheduled to host six-time Grammy nominated singer and songwriter Ed Sheeran on Thursday, September 3, 2015.